After working as an associate for another chiropractor in Bullhead City from 1992-1994 Philip decided to start his private practice. In 1994 he founded Barnard Chiropractic. Dr. Barnard constantly strives to improve and update his knowledge in the field of chiropractic. He has completed extensive postgraduate study emphasizing the treatment and rehabilitation of whiplash injuries, headaches, neck and back pain. A firm believer in the basic worth of every individual and the incredible healing power of the body, Dr. Philip Barnard is a true doctor for the people. In addition, Dr. Barnard is dedicated to not only helping his patients get well as quickly as possible, but also, helping them to stay well for a lifetime. Thank you for visiting our website, and feel free to call our office if you desire to experience life differently (and sooooo much better) than ever before. My staff and I are here for you! Check out our great facility. This is a great way to see our office before even making your first appointment. We’re located on Hwy 95 at 2440 in Bullhead City. Next to Papa Johns Pizza. There are many symptoms to many problems that you may be experiencing. Here are a few of the common ones that we treat. If there is something you may be feeling that you don’t see information on below please contact us for an appointment. Neck and Back Pain plague the majority of American’s each year in either chronic or acute cases. Subluxation of the spine weather it be Cervical (Neck), Thoracic (Mid-Back) or Lumbar (Low-Back) can lead to a number of pain and organ related issues. Sciatica is the sensation of pain that navigates through the sciatic nerve from your lower back to your hips and buttock with the capability to reach down your leg as well. Headaches plague every American and is a main complaint of many of our patients, weather the pain be a dull ache, sharp pain or throbbing sensation Cervical Adjustments have proven to be helpful. Carpal Tunnel Syndrome is a progressive condition, caused by a pinched median nerve around the wrist area, which starts with mild symptoms, including a slight tingling or numbness. Ear infections can be extremely painful and often impact young children. Fortunately, chiropractic can do wonders to improve not only a child’s ear infections, but their overall wellbeing. Please give us a call or use the form by clicking the button below for our contact form. We'd love to hear from you. Neck and Back Pain plague the majority of American’s each year in either chronic or acute cases. Subluxation of the spine weather it be Cervical (Neck), Thoracic (Mid-Back) or Lumbar (Low-Back) can lead to a number of pain and organ related issues. Your spine is the housing unit of every nerve in your body and any subluxation can lead to pressure at the base of your nerves, cutting off contact and sometimes causing pain. Your brain sends messages to every part of your body via nerve endings. Pinching a nerve disrupts the flow of information which can lead to a number of organ malfunctions as well as discomfort in the form of pain. 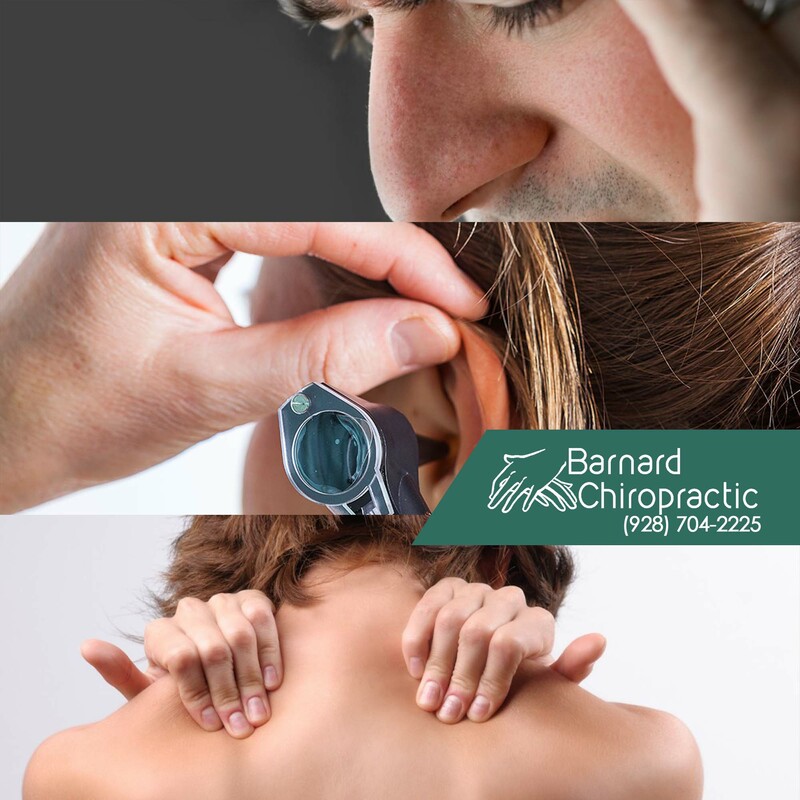 Chiropractic studies have shown that manual adjustments like those used at Barnard Chiropractic have lead to 94% of patients experiencing approximately 30% pain reduction. Disk herniation or a bone spur compressing part of the nerve are the two most common causes of sciatica pain and physical manipulation of the spine is the safest non-invasive way to best remedy discomfort. Did you know that the pain you are feeling is not even coming from your brain in the first place? Your brain cannot feel pain, it is the stretching, compressing, irritation, inflammation or infection of blood vessels, membranes and cranial nerves that produce the ache. Chiropractic studies have shown a 36% decrease of painkillers taken by patients who experience regular headaches as well as a 96% decrease in their number of headache hours in a day simply by receiving regular adjustments.